Microsoft, the global leader of software technology has come so far in context with developments. From Windows XP to Windows 10, the company has facilitated the introduction of many fascinating features that have changed the technological market in many ways. Though, it’s been 17 years since the operating system, Windows XP was launched, it still holds immense importance. The company ceased the support system towards XP back in 2014; the operating software is in use by thousands of operators or users even now. 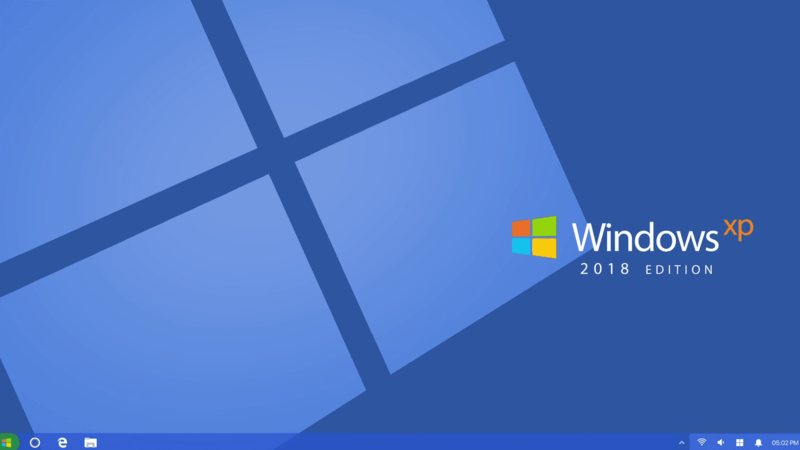 As per the latest NEWMARKETSHARE reports, Windows XP holds a significant share of 6.13 percent that signifies it is being used in many businesses and industries till now. Though the outdated aspects of Windows XP don’t match up with the versatile features of that of windows 10, but what if Windows XP is revived? What brings Windows XP in highlights is an imagination. How would Windows XP look if it is redesigned as per the standards and expectations for 2018? Well, one such imagination of tech youtuber, Kamer Kaan Avdan, has lightened up the glimpse in our eyes, of how Windows XP should look in 2018. Kamer Kaan Avdan, a tech youtuber, who has previously introduced the concept of Android 9.0, Windows 11 and iOS 12, rejuvenated and presented the concept of Windows XP with modifications and advancements that leave the spectators surprisingly dumbstruck. The concept of the 2018 version of Windows XP lays down many alternations, making way for betterments, at the same time, maintaining the essence and originality of the original Windows XP version of Microsoft. Though, the refined version maintains its original color, but many alternations driving in, have eliminated monotonous and outdated features. The rectangular corners have been replaced by fine curve-shaped corners. Windows 10, being the most recently launched version of the operating software, has influenced the redrafted version to a great extent. The login screen, the power menu and the task bar have been refurnished and inspired from the features of Windows 10. The most attractive element of the proposed version proves out to the start menu which has the touch of the original version combined with additional yet modern tiles. The timeline also seems to be influenced by the features of the original version yet modified. In addition, with these significant changes, some appreciable alterations have also been observed in the redesigned mail app, the file explorer and many other minor yet commendable changes. The science and tech youtuber presented the video as a comparison between the original version and the redrafted version. The video has been created in a very sophisticated manner that is being appreciated by both the critics and spectators. There was one cartoon assistant also, who originally debuted in the Microsoft Bob. Apart from the technical modifications, the background music, the editing and the simultaneous comparisons, altogether add up to the perfection of the imagined version of this operating system. However, the video has gathered enough popularity but the fact is it’s just an imagined version by an individual. No matter how perfectly it has been drafted, it’s just an idea and not an execution. Let’s see whether this amazing approach could transform into a commendable version of Windows. I want it like now!!! I like this whole idea very much but there seems to be no path to download? Horrible vertical-list menu from Windows 10. Go to hell with such “2018 edition”. I agreed with you. It could be a theme and people who still love the look of XP can use the theme on the latest windows version. It looks like Windows 10 in XP theme.? Old is gold. I appropriate it.